The poor and inappropriate management of our PHC system, poor welfare packages for the health workers, bad roads, and poor political will in particular have been critical barriers to effective health service delivery. For instance, the reported national coverage in Nigeria for full immunization is less than 13%, one of the lowest rates in the world. This low coverage is traceable to political unrest and insurgency in the northern part of the country. This study was therefore aimed at evaluating the factors that militate against the effective implementation of primary health care system in Nigeria. The findings from this study may help to improve the management of children in health centers. In addition, they would also form a database on which further studies can be built and carried out. This was a cross-sectional study that aimed to determine the factors that militate against the effective implementation of PHC system in Nigeria. The study was conducted at a selected four PHC centers in Enugu State from November 2014 to January 2015. The health centers were selected randomly from the four districts of the city. The source populations all comprised health workers in the selected PHC centers. Consent and approval were given by the head of each health center and the confidentiality of responses was also affirmed. The primary health center was chosen by systemic sampling from about eight primary health centers in Enugu metropolis. Health workers who visit the health center regularly, are employed as full-time workers, and gave consent were included in the study, while part-time health workers and those who did not consent were excluded. Health workers who fulfilled the inclusion criteria were consecutively recruited into the study. The instrument employed for data collection was a structured, self-administered questionnaire. The questionnaire contained all relevant items ranging from work load, terms of service, immunization, housing and workers' remuneration, waste management, to environmental protection. The sixteen-item questionnaire was elaborated with a Likert scale. A Likert scale is a psychometric scale that is widely used for scaling responses in survey research. A Likert scale measures attitudes and behaviors using answer choices that range from one extreme to another. Unlike a simple "yes/no" question, a Likert scale uncovers degrees of opinion. By converting the nominal scale such that Strongly Agree = 5, Agree = 4, Undecided = 3, Disagree = 2, Strongly Disagree = 1, and hence using a cutoff point that is the average of the scores = 3.00 (that is, 5 + 4 + 3 + 2 + 1 = 15; 15 χ 5 = 3), it is assumed that any mean of 3.00 and above should be interpreted as positive, while any mean below 3.00 will be interpreted as a negative factor. Data was analyzed with the Statistical Package for the Social Sciences (SPSS) Chicago, software, version 18. Data presentation was in form of tables. Pearson's chi-square was used to test for the relationship between categorical variables. Statistical significance was set at P < 0.5. [Table 1] shows the demographic variables of the subjects. A total of 169 health workers were recruited from four primary health centers. The mean age of all the participants was 38.42 years SD = 9.8, while the male:female ratio was 2:1. Of the subjects, 59% of the subjects were aged 30-39 years. The respondents opined that increased workload, safe and efficient transport to work, and government participation are positive factors in the implementation of PHC. Existing equipment and manpower on one hand and job security and salary on the other hand are negative factors in the implementation of PHC in this setting. This means that the respondents believe that there is not enough equipment and manpower, and no good job security and good salary for primary health workers [Table 2]. [Table 3] shows that the respondents opined that adequate supply of gloves, needles, bandages, good access to drugs and medications, a good cold chain system, and full implementation of an immunization program all exist in the PHC centers, and all contributed positively to its development. [Table 4] shows that the respondents believed that good disposal of hospital waste, a good referral system, a good record system, and a modern toilet disposal system (water cistern) are operable in all the PHC centers studied, and all contributed positively to its development. Adequate community participation, culture and religion, access to safe and clean water, and steady electricity, on the other hand, are nonexistent in the PHC centers. Moreover, respondents also noted that culture and religion have a negative impact on the implementation of PHC. [Table 5] compares the correlation between gender and the implementation of PHC. There is a strong negative correlation between gender, and culture and religion (X 2 = -0.24, P = 0.00), and a strong positive correlation between gender and the referral system (X 2 = 0.23, P = 0.03) and the record system (X 2 = 0.17, P = 00.03). We observed from this study that health workers agreed to the fact that increased workload, safe and efficient transport to work, and government participation are in existence in all the PHC centers studied, while equipment and manpower on one hand and job security and salary on the other hand are not available. In low-and middle-income countries, health workers are essential for the delivery of health interventions. However, inadequate health worker performance is a very widespread problem. For instance, a 2008 report indicates that the Ministry of Health in Kenya had a very high vacancy level. In fact, there are 1.5 health care workers per 1,000 population in Kenya, which falls below the standard figure of 2.3 per 1,000 population reported in analyses by the World Health Organization (WHO). Other factors, in this study that were seen to strongly impede the flow and establishment of PHC are the lack of both job security and good salaries. These factors dampen the motivation of primary health workers. The PHC centers studied showed that much remains to be desired, especially in terms of manpower, communication, and the remuneration of health workers. Kiwanuka SN, Ekirapa EK, Peterson S, Okui O, Rahman MH, Peters D, et al. Access to and utilisation of health services for the poor in Uganda: A systematic review of available evidence. Trans R Soc Trop Med Hyg 2008;102:1067-74. Nigeria-Primary Health Care Policies - Environmental. Available from: http://www.mongabay.com/history/nigeria/nigeria-primary_health_care. [Last accessed on 2015 Feb 12]. 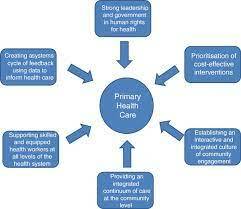 Nigeria Primary Health Care Policies. Available from: http://www.photius.com/countries/nigeria/society/nigeria_society_primary_health_care_~10006.html. [Last accessed on 2015 Feb 10]. WHO. Health Systems Strengthening Glossary - World. Available from: http://www.who.int/healthsystems/hss_glossary/en/index8.html. [Last accessed on 2015 Feb 10]. Kanchanachitra C, Lindelow M, Johnston T, Hanvoravongchai P, Lorenzo FM, Huong NL, et al. Human resources for health in Southeast Asia: Shortages, distributional challenges, and international trade in health services. Lancet 2011;377:769-81. Jayasuriya R, Whittaker M, Halim G, Matineau T. Rural health workers and their work environment: The role of inter-personal factors on job satisfaction of nurses in rural Papua New Guinea. BMC Health Serv Res 2012;12:156. Human Resources Action Framework (HAF). A Guide to Develop and Implement Strategies to Achieve an Effective and Sustainable Health Workforce. Cambridge, Massachusetts: Management Sciences for Health; 2009. Jamieson S. Likert scales: How to (ab)use them. Med Educ 2004;38:1217-8. Norman G. Likert scales, levels of measurement and the "laws" of statistics. Adv Health Sci Educ Theory Pract 2010;15:625-32. The Likert Scale: Format and Sample Types of Questions. Available from: http://www.brighthubeducation.com›Special Ed›IDEA, IEPs and the Law. [Last accessed on 2015 Feb 10]. Republic of Kenya Ministry of Health: Human Resources for Health Strategic Plan 2009 to 2012. Nairobi, Kenya: Ministry of Health; 2009. Republic of Kenya: Reversing the Trends. The Second National Health Sector Strategic Plan of Kenya: Serving the Health Workforce in Kenya 2009/10 Annual Status Report on the Implementation of the National HRH Strategic Plan 2009 to, 2012. Nairobi, Kenya: Ministry of Health; 2011. Dielemann M, Cuong PV, Anh LV, Martineau T. Identifying factors for job motivation of rural health workers in North Viet Nam. Hum Resour Health 2003;1:10. Willis-Schattuck M, Bidwell P, Thomas S, Wyness L, Blaauw D, Ditlopo P. Motivation and retention of health workers in developing countries: A systematic review. BMC Health Serv Res 2008;8:247. Dolea C, Stormont L, Braichet JM. Evaluated strategies to increase attraction and retention of health workers in remote and rural areas. Bull World Health Organ 2010;88:379-85. Arevshatian L, Clements C, Lwanga S, Misore A, Ndumbe P, Seward J, et al. An evaluation of infant immunization in Africa: Is a transformation in progress? Bull World Health Organ 2007;85:449-57. Community Participation in Health Service Reform. Available from: http://www.apo.org.au/service-reform-development-innovative-remote-aboriginal. [Last accessed on 2015 Feb 11]. Culture, Public Health and Community Development. Available from: http://www.unpan1.un.org/intradoc/groups/public/documents/IDEP/UNPAN003345.pdf. [Last accessed on 2015 Feb 11].